FNESS and the Justice Institute of BC (JIBC) have been working together to implement training to communities using a regional approach. This initiative has been confirmed and will be implemented in 2018-2019. The training enhances the capacity of volunteer firefighters to respond and suppress residential fires using exterior attack methods. 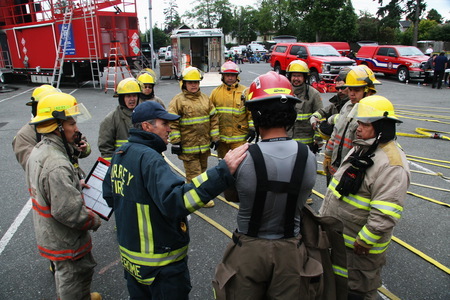 In addition, the enhanced leadership and administration of community fire departments ensures the safety of First Nations firefighters in attending a fire scene. FNESS’s annual competition brings together First Nations from across BC to provide an opportunity to share best practices and potential collaborations. The event is comprised of two days of intense training on Exterior Attack level certification criteria, one day for friendly competition which allows teams to network and one day for FNESS members to attend our Annual General Meeting. The First Place winner of the competition represents BC at the National Firefighters competition hosted by Aboriginal Firefighters of Canada.